A Limited Number Of Reprint Rights Are Now Available For "RSS Announcer"! I started to see the traffic from my RSS feeds start pouring in almost over night . I have been banging my head against my monitor for years trying to find the secret formula to get a good and steady stream of traffic to my web site. RSS Announcer is an amazing tool and has turned my mediocre traffic and sales numbers into something I can be proud of in days not years, thanks guys I owe you one. For a Limited time you can get Resale Rights to "RSS Announcer", and keep 100% of the profits from all your sales ! Sell only 2 copies of this great new software and you will all ready be in the profit zone! Most of my friends think I am crazy for selling RSS Announcer, they all agree I should have kept it top secret and only shared it with them! Then I told them that I was also going to sell resale rights. When they heard the price they knew that I had lost my mind ! The first thing they wanted to know was how big of a percentage I was going to be giving to my resellers. I said this is no affiliate program, we all ready have one of those. Anyone that buys one of the Limited Number of Resale Rights Licenses I am going to offer will get to keep 100% of the sales they make! If you have ever wanted to know how internet marketers make the boat loads of money they do on the internet this is it. You need to find a Great Product, that has not been all ready marketed to everyone on internet so heavily that every one that needs it, or wants it all ready has it, and everyone that doesn't need it is sick of hearing about it. Well I know that you can't say that about RSS Announcer because it is brand new! You have not heard of it yet, am I correct? Of coarse you haven't because it was just released after being in development for the past 3 months, and hardly no one has the Resale Rights to this hot new product yet. If you have ever planned to quite your boring day job and make boat loads of money selling something through Internet Marketing, then RSS Announcer is exactly what you have been looking for. It really delivers in the department of generating a massive income! Anyone who uses owns a web site or can send an e=mail can make a ton of money with this information! But you all ready realized that or you would not be on this page, checking out the resale rights, correct! 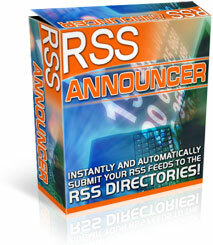 Here's how it works, you will be able to sell RSS Announcer to as many people as you want for any price above $ 67. We recommend you sell it for between $ 97 and $ 147 dollars. But you may under no circumstances ever sell it below $67 this will keep the market at a good level for the other resellers. You may also NOT give this product away for free or as a free bonus with any other purchases. If that's not enough to get you to buy right away, I will also let you in on all the sources I personally use to help generate sales for all my products. We will email any new sources we find that will do nothing but bring tons of traffic and buyers to your site. There is nothing magical about making money on the internet its just about knowing how to bring traffic to your site, we will show you how with all the sources we use now, and keep you updated as we find more. Our RSS Announcer resale rights package would be insanely under priced if I charged $697 for it. You would make it all back in a matter of a couple of days. But as you have seen above I have gone a little crazy on this one, which is why I am letting resale rights go for only $297. All of my friends say this is way too low, but this way you will be able to make back your initial investment with only a few sales, and be on your way to making so much money that maybe you will keep me in mind when your ready to do a joint venture with someone. You can sell unlimited copies, and keep 100% of the profit. Free updates to RSS Announcer software forever, and resale rights to the updates as well. You will receive all the sources we use to bring traffic to our sites to sell our products on the internet, and all the new sources as we come across them. A copy of RSS Announcer web site's proven sales letter, all the graphics, and thank you pages so you can upload them to your web space and be reselling the software in minutes after your purchase. If the order link below works, then you can still purchase the resale rights. If you click the link below and receive a message saying the resale rights are sold out, you're probably out of luck. If this happens you can email us and we will put you on our list if any resale rights packages ever become available again. As I said above, the current price for resale rights is an insanely low price of $ 297. This is for a limited time as I will probably come to my senses raise it soon, so if you want to make some serious money with this opportunity.... Order now! Before it is too late! You'll be able to sell unlimited copies and keep 100% of the profit to yourself! And Finally be selling your own product on the internet! RSS announcer is so easy to use, that even a child could figure it out. When we were having the software developed my nine-year-old son did most of the testing. He had a ball watching all the content we created showing up immediately in the major RSS directories and knowing that he and put it there all on his own what this simple to use the software. I used to spend hours manually sending me my feeds to all of the major directories. RSS Announcer submits all of my feeds to the major feed directories automatically with the push of a button and completes all the submissions in minutes rather than hours! When you open RSS Announcer's interface you will be prompted to enter in some basic information such as the title and description of your web site, plus the actual link to your RSS feed, the category of which your RSS feed falls under, and a few other small things. It will then save this information for future use so as you build more and more RSS feeds up, RSS Announcer will remember them for the next time you use the software. I absolutely guarantee you will be amazed when you see the amount of time that you can save, the amount of content, you can spread all over the Internet, and the amount of extra money that content can be bringing in immediately. 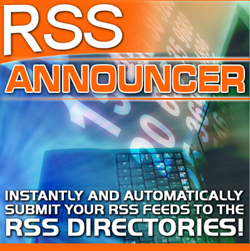 Don't you owe it to yourself to try RSS announcer today? And "I'll Make You An Offer You Can't Refuse"
Order reprint rights to "RSS Announcer" right now and not only will you get the rights to sell this software keeping all of the profits for yourself - I'll also toss in "PRIVATE LABEL RIGHTS"
You will also get the actual source code to it also! You can even claim yourself as the creator! And to top this deal off I will even allow you to re-sell the Source Code to others just as I am to you here! Is it easy to edit the source code? Call it RSS Master, RSS Submitter, RSS Super Submitter, you name it its up to you, or you may just resell it under it's current name "RSS Announcer "
we will even include videos to show you how to rebrand it step by step! But Hurry- I'm very serious when I say this is a limited time offer! If you wait until tomorrow this offer may very likely be over by then! Last Minute Bonus: Grab these rights now I'll also toss in this incredible bonus that is worth more than the cost of these rights by itself! I have secured MASTER RIGHTS to REA to and am now passing them onto you as my way of saying thank you for using BLG This is a $197 value! We have arranged a special deal for you to be able to get three months free to the new amazing way to make sure your web site visitors "Can't Miss" any message you wish to place in from of them! Get your 3 months free membership now before it's too late! This is a $14.95 per month value and you get 3 months FREE! The biggest thing to learn in making money on the internet is TAKE ACTION! You will be glad you did, and with only 2 sales of the software or only 1 sale of the rights to someone else your order is paid for and the rest is pure profit! It doesn't take a genius to figure out how easy it is to make a great income reselling this incredible package! You've got absolutely nothing to lose – you can do this! We're so sure that you will love “RSS Announcer” that we're offering an Unconditional 100% Money-Back Guarantee. If you are not completely satisfied with your resale rights purchase, simply let us know within 30 days and we'll refund your money, in full, with absolutely no questions asked! You've got absolutely nothing to lose – and a ton of to gain! Get the software you need to make fast cash in Internet Marketing today! 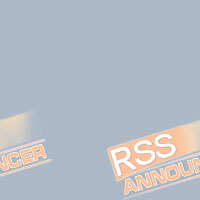 Order “RSS Announcer ” Now! And get yourself ready to spread your site and RSS Feeds all over the Internet. Click here to order right now for only $297.00 (even if it’s 3:00 am in the morning). Believe me, you can do this, and you won't regret it for a moment. P.P.S. Hurry This offer could end at any time!